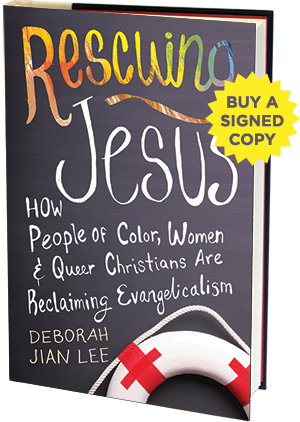 Deborah Jian Lee is delighted to work with Chicago-area bookstores, The Seminary Co-Op Bookstores and Women & Children First, to offer autographed copies of Rescuing Jesus. Seminary Co-op: Signed copies will be available at the Co-op and 57th Street Books locations. Inquire in-store, by phone, or include a request for a signed copy in your web order. Women & Children First: Place your order online or call the store at 773-769-9299. The Seminary Co-op Bookstores have been independent and member-owned since 1961. Founded by 17 students, it has grown from a small basement bookstore into a labyrinth of books at two locations in Chicago's Hyde Park neighborhood, now with over 53,000 members. Women & Children First began in a modest storefront in 1979. The store's purpose is to promote the work of women writers and to create a place in which all women would find books reflecting their lives and interests. It is one of the largest feminist bookstores in the country, stocking more than 30,000 books by and about women, children's books for all ages, and the best of lesbian and gay fiction and non-fiction.